White River Watch is a small cavern located east-northeast of Honningbrew Meadery and southwest of the Ritual Stone. The cave is home to the White River bandits. It has an exterior camp and two interior zones: White River Watch and White River Overlook. Outside the cave there are two bandits. The two bandits positions make it very hard to approach the caves stealthily. The first bandit stands guard near a campfire and overlooks the dirt path, and the second bandit stands higher up, near the entrance to the cave. In the bushes to the left just before the campfire is a bear trap. The first bandit carries a note which warns Rodulf to stop making a fool of Hajvarr's uncle. On the other side of the bushes is a purple mountain flower, and on the opposite side of the path is a blue mountain flower. There is a cooking pot hanging over the campfire. On the table by the campfire is a sprig of frost mirriam, a cabbage, a garlic bulb, two leek and some cheese. There are a number of crates and food sacks around the table and to the left of the entrance. There is a novice-locked chest just north of the fire and a rack holding three whole salmon to the right. By the cliff face to the south is a wood chopping block, another purple mountain flower and a lavender bush. When you enter, Ulfr the Blind asks you to identify yourself, thinking you are Rodulf, "Eh? Who's there? Rodulf, that you?" If you try to pass yourself off as Rodulf, he will advise you to talk to the boss, "Boss was looking for you - said he'd be up at the summit. Better not keep him waiting." He will return to "reading" his book, which is actually blank. If you talk to him again, he will offer some encouragement, "Good luck out there." If you threaten him, he will call out for help, "Hey! Somebody get down here! Help!" This will make two bandits spawn in the next room: they will not appear otherwise if it is your first run through, but they will spawn if you return to the cave after killing everyone in it to continue picking up loot. To the right of the entrance is a pile of food sacks, barrels, and crates. Among the crates are two patches of bleeding crown fungus, with two bunches of dried elves ear hanging from a rack above. By a chair is one patch of each of the following: fly amanita, imp stool, Namira's rot, and white cap fungi. A basket on the ground behind Ulfr contains four leeks. The passage continues to the east, passing a small set of shelves holding a fur cuirass. To the right is a barrel with a quiver containing ten iron arrows and further to the right is a flight of stairs leading up. Around and behind the stairs are three patches of white cap and two patches of imp stool fungi, a wardrobe, a cupboard holding a bottle of alto wine and a bottle of wine, and a few food sacks. At the top of the stairs there is a pile of firewood with an iron war axe on top and a barrel of ingredients beside it. The stairs continue to climb to the northwest, passing a ledge with a small table holding a fur helmet. There are five more patches of imp stool and four more of white cap fungi in this area. Bandit #1: "So, you in?" Bandit #2: "...Yeah. We can't have that rheumy-eyed fool as our watchman, even if he is Hajvarr's uncle. Time we dealt with both of them." Bandit #1: "We strike tonight, at dusk. Be ready." Bandit #3: "You think it'll work?" Bandit #4: "'Course not. Dogs I could train. But a half-starved wolf? Not a chance." Bandit #3: "Right. Lucky if it doesn't rip our throats out." The conversation is between two bandits on the same level of the cave: there are another two bandits in the next room too. One is above the first two, and another is higher up and to the left, but is still within range to be alerted to your presence by the others. You can choose to attack them by yourself, or you can pull a chain on the right-hand wall that releases the aforementioned wolf. This provokes a response by the bandit closest the cage, "Look out! The wolf is loose!" This particular wolf is unique: it will attack the bandits first due to a particular faction, but it is still hostile to you. Under a bush to the left by the entrance to this section is a white cap fungus. Further along are two Namira's rot fungi, and inside the novice-locked cage is a random potion of healing and a patch of imp stool fungus, plus the wolf if you haven't released it. There are a couple of barrels to the right of the cage, at least one of which holds ingredients. By the barrels under the rock slope is a blisterwort fungus. The ramp leading up is against the right-hand wall and there is a ledge half way up containing a wooden bench, with an iron warhammer to the left, two patches of imp stool, and three of white cap fungi. At the top you'll see a small hanging cage overhanging the chamber below, this is obviously the cage mentioned in the note to Rodulf. There is a dead bandit inside the cage. Carefully climbing down the ledge in front of the cage should allow you to just reach the body which carries the same items as a normal bandit. On the right of the path is a small set of shelves holding an iron mace, a random poison, a bottle of alto wine and two bottles of wine. On the left-hand side of the path is a bleeding crown, and on the right, a white cap, followed by a fly amanita. There is another fly amanita by the wardrobe across the way, and a bleeding crown by the brazier to the left. Beyond the three barrels there is a fly amanitia and bleeding crown fungi. There is also another pickaxe, which is handy for the iron ore vein located here. On a ledge beyond the vein there is a Namira's rot and a fly amanita fungi. The path continues to rise heading north. Along the path upwards there are three bleeding crown on the left, three fly amanita and a bleeding crown fungi on the right. The overlook is aptly named, for it overlooks a great portion of the White River. 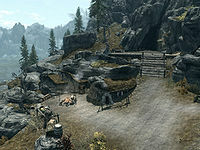 From this area you can see a distance along the road to Whiterun, giving plenty of time to lay an ambush along the road. Hajvarr Iron-Hand sits here and keeps watch: he has also kept a journal on some of his thoughts, which he carries with him. He is always hostile and when he detects you he will attack. He also carries the unique Ironhand Gauntlets, which are a pair of steel Nordic gauntlets with a fortify two-handed enchantment. On the table where Hajvarr sits lies a random greatsword, an iron shield, a random potion of health, and a random potion of enhanced stamina. If you turn back towards the cave, there is a boss level chest and a large coin purse to the left of the wooden steps, and a snowberry bush to the right. You can now either make your way back through the cave, or take the slightly more treacherous path over the rocks. It isn't too difficult to pick a path down if you head north along the rocks. Eisa Blackthorn and Ra'jirr are former members of the White River gang. Eisa's journal tells how they choose to leave, and their adventures afterward. Whiterun guards will alert you to this location with the comment, "Careful if you cross the river to the east. Old Hajvarr Iron-Hand and his brigands are holed up in that cave, White River Watch." Carriage drivers will also alert you to its location with the comment, "Got keen eyes? Might see nasty old Hajvarr up on White River Watch. Piece of work. Jarl should just run him out and have done with it." If you kill the two bandits that come to Ulfr's aid and then sheathe your weapon, he will stop fighting and return to the table where he was sitting. Hajvarr's journal mentions capturing a wolf from some cargo moving down the road, which is likely the wolf that can be found inside the cave. If you do not release the wolf when going through the cave, and then exit to the overlook and reenter, the wolf will have spawned outside the door to its cage. It will not be hostile. Opening the cage either by pulling the chain or picking the lock will turn the wolf hostile again. This page was last modified on 7 January 2019, at 22:07.